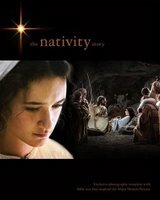 Peter Chattaway has linked to Christianity Today's interview with Mike Rich - the writer for The Nativity Story. There are a few new things to comment on. Firstly, it appears that Rich's image has changed somewhat. 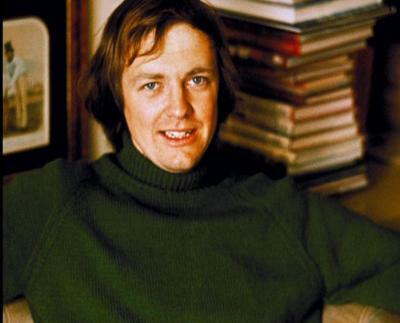 The best photo of him available back in February was this one, where he looked more like an Evangelical Christian trying to be a writer than the accomplished film writer he actually was. His "new" look (because it might just have been an old / bad photo) is much better. Perhaps I'm being fickle here, but this small detail in itself increases my (already fairly buoyant) optimism about the film. I think some purists will perhaps raise an eyebrow at the fact that we blended the two Gospel narratives, with the shepherds [from Luke] and the Magi [from Matthew]. Yes, we do show that quintessential Nativity scene at the end, with the shepherds and the Magi there together; purists are likely going to take exception with that. But if we had made a film that would have been strictly respectful to Matthew, people would wonder where the shepherds were. If we made a film that was strictly respectful of Luke, people would wonder where the Magi were. So, the film is called The Nativity Story, and that's what we're focusing in on—that quintessential moment that millions of individuals still put out on their fireplace mantels in December. I think this approach is justified in a film called The Nativity Story, although the shepherds and the magi arriving together seems at odds with the idea that the Magi visited Jesus in a house. Certainly it would have been a mistake for this project to separate the two stories out (unless they did something really different and complex with the differing traditions). 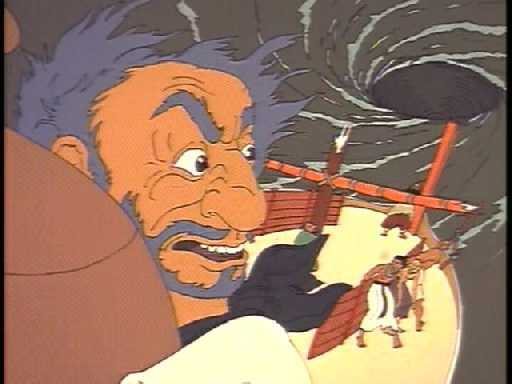 I do hope though that future, life-of-Jesus films make similarly carefully considered decisions about how they use the stories from Matthew and Luke, in what would be something of a different context. 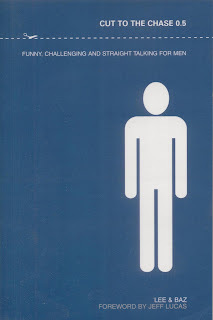 Here's the corresponding Scene Guide to Robert Markowitz's David, which I reviewed last week. In drawing this up, I'm aware several of the incidents are paralleled in 1 & 2 Chronicles, but I've given preference to the older Samuel, Kings (and Psalms). One of the particular points of interest in this film is the use of the Psalms. Firstly it's a little strange that this up-to-date version of David's life, spoken in modern English, is punctuated every now and then by Psalms taken from the King James Version. What is more interesting is how the tone of those Psalms darkens as the film progresses. The first Psalm David recites is Psalm 23, which, despite its frequent use in funerals, is actually incredibly upbeat. This is a man so sure and confident of the hand of God in his life that he doesn't even fear a hypothetical journey through the valley of the shadow of death, and is more focussed on the table that God has prepared for him than it's less than desirable location. This is followed by two Psalms that are increasingly concerned by the existence of said enemies, Psalms 66 and 68. By the fourth Psalm (Psalm 63), David is beginning to sound a little more distant from his God, even if he is choosing to offer him worship anyway. That is quickly followed by pleas for mercy (Psalm 57), demands for vengeance (Psalm 94), repentance (Psalm 51), and finally a desperate plea for God to speak / act as the writer's enemies close in on him (Psalm 83). It's fair to say that the progression of these Psalms corresponds to the way the tone of the film develops. This also corresponds roughly to the pattern of David's walk with God found in David and Bathsheba. 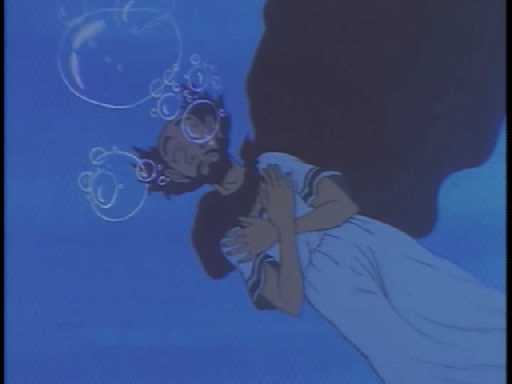 That however, may also be part of this film's tendency to de-mythologize the stories. If so, it is an interesting place to start. Perhaps the most striking example of this is in the battle between David and Goliath. Goliath is actually well short of the height given in the text (six cubits and a span - over nine foot), still large compared to David, but no so extraordinary. It does bring to mind the way Gregory Peck's David suggests that even in his lifetime Goliath's height has been exaggerated, only for the film's climatic flashback to actually verify the biblical measurement. 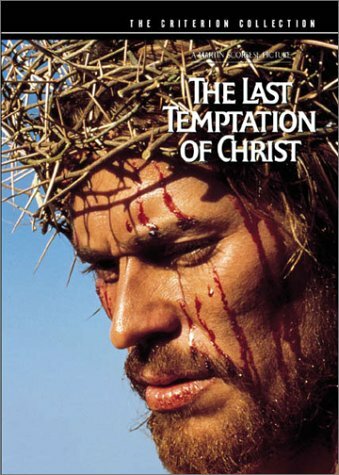 Way back in February I started reading Nikos Kazantzakis's "Last Temptation" (in Greek "O Teleutaios Peirasmos"), the book that Martin Scorsese adapted for his 1988 film Last Temptation of Christ. I'd been meaning to read it ever since I first saw the film back in 2000, and the release of "Scandalizing Jesus? 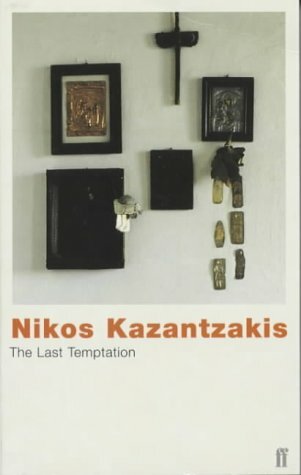 : Kazantzakis's The Last Temptation of Christ Fifty Years On", featuring an article by my friend (and oft quoted) Peter Chattaway finally spurred me on to get a copy. I must admit, one of the reasons it's taken me so long is that I wasn't particularly inspired by the first few chapters. Then what with a ton of books about babies to read (as well as a lot else), and never having been a great reader of novels anyway, it's taken me until the latter half of the summer to get around to finishing it off. I should add that I'm aware that I'm certainly no book critic, and so if I totally miss the point in anything that follows, please forgive me - these are only my initial impressions. Overall I feel quite differently about the book and the film. The film in some places is fairly unpalatable, yet it also soars to places far higher than anywhere the book took me. Particularly significant in this is the characterisation of Jesus in both works. 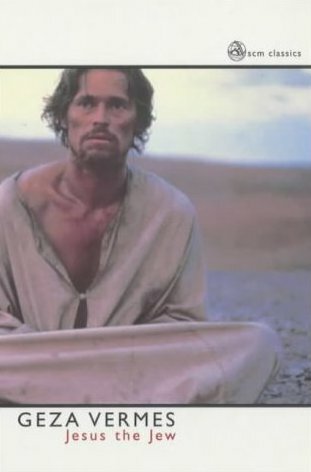 Dafoe's Jesus doesn't really seem to comprehend with the "Son of Mary" of the novel (who tends only to be called "Jesus" once his ministry gets going). Dafoe is far tougher and aggressive than his counterpart, not to mention far more Anglo-Saxon. In the book on the other hand the prologue takes roughly 190 of 575 pages - about a third. But the temptation sequence lasts for only 60 pages - barely a tenth. So Scorsese significantly reduces the opening, and middle sections of the film to concentrate on the temptation sequence. Given both works are named after this sequence this is perhaps fair enough, but it does mean that Jesus comes off as weirder in the film than in the book. There are a few characters who were left out of the novel. Matthew (the tax collector and gospel writer), and Simon the Cyrenian are both wonderfully presented, and my two favourite passages in the book are Matthew's call and Simon's carrying of the cross. I've always had an affinity with Matthew (due to being named after him I guess), and so whilst I recognise Kazantzakis's history is perhaps a little off here, I'd like to quote this passage anyway. Sadly, there weren't many passages that I enjoyed that much. I found the dialogue quite clunky in places, particularly the spoken dialogue. 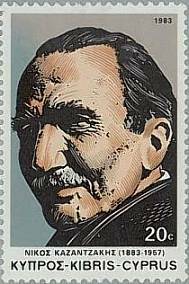 Perhaps Kazantzakis was going for realism, or perhaps it's just a difficult work to translate, or the translation no longer captures what it once did. The strength of the novel is in it's concepts and ideas, combined with it's desire to take the humanity of Jesus seriously at a time when that was a risky business. Today such honest examination has been quickly bypassed in the rush to get to soulless, facile mocking. One only has to search for "Jesus" on YouTube to get the idea. Two final observations. Firstly, my opinion on the film's view of Jesus is that he (a imagines himself to have been a sinner (as do others), when in fact he isn't. As far as I recall, the novel confirms this. 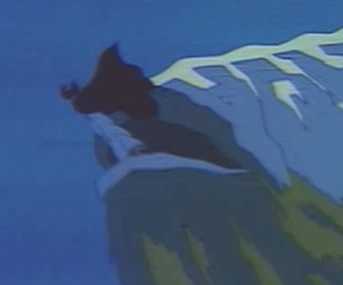 Secondly, some have criticised the temptation sequence as showing Jesus actually sinning, before going back in time. In my opinion, this is incorrect, even though there is some ambiguity. The book, however, is quite clear that these events never actually happen. What is interesting is that many of the other objectionable parts of the movie, were in fact added by Schrader and Scorsese. I'll hopefully get around to reading and reviewing "Scandalizing Jesus? 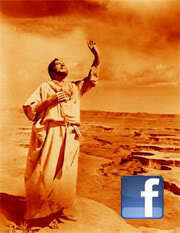 : Kazantzakis's The Last Temptation of Christ Fifty Years On", in the next few months. When I launched my scene guide last month I bemoaned the lack of a region 2 release of the full version of Jesus of Nazareth. Well thankfully it looks like the wait is nearly over. ITV DVD, a new label set up to distribute programmes screened by ITV, is releasing a stack of new programmes, and a full uncut version of Franco Zeffirelli's film will be released in October. At this stage, it's not yet clear whether there will be any special features or not, but it's great that the full version will finally be available. Prior to Mel Gibson's The Passion of the Christ, Jesus of Nazareth was generally considered the definitive version within Christian circles. Whilst, I have a number of quibbles with the film, it did make my recent Top Ten Jesus Films list, and has a great deal going for it. I've been thinking for a while that I might do some podcasting related to this site, and when I get around to it (hopefully within the next month or so), this will probably be the first film I tackle. 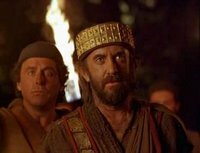 I made a few comments earlier in the month on the Visual Bible's 2003 adaptation of The Gospel of John. I've just got back from Greenbelt Arts Festival to find a couple of comments from a new blogger, devoting their blog (gospelofjohnthefilm.blogspot) to the film. I'm hoping this is going to be an ongoing blog rather than just a one off post for the sake of publicity. The film hasn't really gained as much attention as it deserves, and it would be nice to see some in depth discussion of it. Hopefully this blog will be a good source for that. Anne Thompson has posted up a press release about the forthcoming black-Jesus movie Color of the Cross. Its main piece of news is just confirming what I mentioned three weeks ago - that the film is due for release on the 27th October 2006. However, there are a couple of interesting quotes which I'd like to comment on. "Color of the Cross is not about dividing people, it is about broadening their perspective," said writer-director LaMarre, who also stars as Jesus in the film. "I believe that Jesus was black. Through other people’s eyes he may be white, Latino or even Asian. We want to convey that it is not what the messenger looks like that is important, it is the message itself." La Marre's belief that "Jesus was black" is quite surprising if he means it in an objective historical sense. However, the original website made a number of points to back this up which I commented on at the time, so perhaps he does. That said, when he says in "other people’s eyes he may be white, Latino or even Asian" it at least suggests the possibility that he means his original statement in a more subjective sense. Certainly I share his hope that this film will unite people, and challenge white Christians about their own perspectives. I also hope that as it comes from a different racial perspective it will enhance my own understanding of the gospels. La Marre repeats here the idea that Jesus's execution was, in part, due to his race, and I'm interested to see how this aspect is presented. Nu-Lite Entertainment chose to team with Rocky Mountain Pictures and its principals Ron Rodgers and Randy Slaughter for the theatrical release of the film following the company's proven track record with such films as End of the Spear. Rocky Mountain Pictures, formerly RS Entertainment, has been successfully releasing films since 1988. Fox Home Entertainment, which handled the domestic home video distribution of Passion of the Christ, will release Colour of the Cross on DVD following its theatrical release. The choice of Rocky Mountain and Fox to handle the theatrical and DVD releases is also interesting. Going by the data on the IMDB, End of the Spear about made its money back on it's theatrical release so presumably that is what they mean by "proven track record". Fox has also done well on DVDs for The Passion of the Christ, but in both cases they are picking up the easy risk free element after someone else has done the hard work. One final point. I notice from the stills on the website that the high priests will be white. It will be interesting to see if this film tries to square that one, and how aware it will be of the anti-Semitic issue in general. I do hope this film does well, and that those of us not in America will get a chance to see it soon. Thanks to Peter Chattaway for the tip off. I recently got hold of a copy of Jesus Christ Superstar (1973) on DVD - well worth it for the extras. The main attraction is a featured commentary with director Norman Jewison, and Ted Neeley (who plays Jesus). 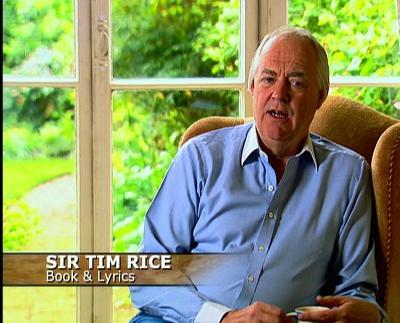 I've not had a chance to listen to that yet, but the disc also includes an interview with the musical's lyricist Sir Tim Rice. Much of what Rice says is similar to excerpts from an interview with him used for the Radio 4 programme Silverscreen Beats. Rice talks about how he and Lloyd-Webber were put together by an agent, who didn't really like his stuff, but thought Webber would go somewhere. Looking back he realises that releasing the musical as an album made Superstar far more successful than if it had just been produced for the stage from the start. It seems strange listening to someone who is now a knight of the realm talking about their days as a young rocker - particularly when it was those younger days that eventually led to their knighthood. You get the feeling that at the time they felt they were doing something slightly anti-establishment and yet as a direct result they have ended up as pat of that establishment. 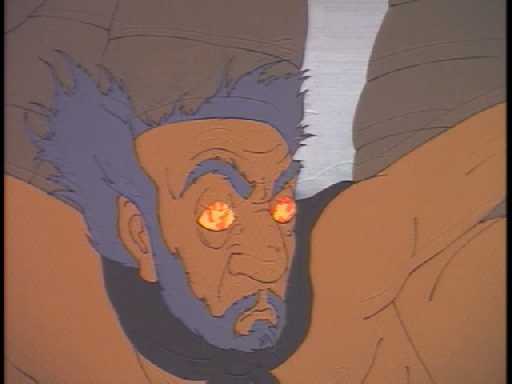 It makes me wonder which of today's shocking rebels will be the Sir Matt Lucases of the future. Anyway I digress. Rice also talks about how his sympathies definitely lie with Judas who acted as most people would in his opinion. Superstar is a "human story" rather than religious one, although Rice stresses how it leaves the question of Jesus's divinity open to interpretation. He also shrugs off the criticisms of anti-Semitism as "barmy". Personally I never really saw it that way either before all the discussion about The Passion of the Christ, but then it was really only then that I "got it". But in the light of all that discussion, then the way the musical pretty much lets Pilate off the hook, blaming instead the fickle crowd of Jews who quickly switch their loyalties does stray into problem areas. That said, the way the film portrays it, as a group of young hippies acting out the musical, mitigates this somewhat. 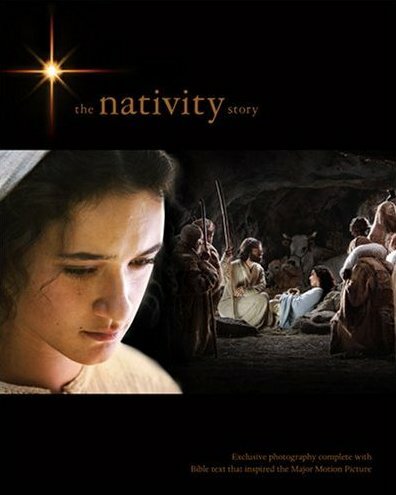 The official website for The Nativity Story has added a second behind the scenes featurette. 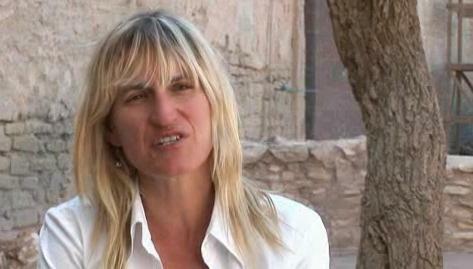 This time it's mainly Catherine Hardwicke's talking us through the project. It's pretty much the kind of thing one would expect from a publicity short. Hardwicke stresses her religious upbringing, talks about attention to detail and historical accuracy, and so on. Certainly there are a several points of similarity with writer Mike Rich in the first featurette. Catherine has had great success really capturing the lives of young people in particular and the conflict and crisis, and pain of being that age growing up and the idea of her bringing that point of view to biblical times I think is really interesting. ...which nicely sums up some of the thematic elements, and I suppose why they were attracted to her as a director. Certainly the way she has captured adolescent life elsewhere is what makes this project about a teenage Mary most interesting. Whilst the featurette doesn't really say too much, you get a bit of a feel for the look of the film. One thing, in particular, that does stand out is Keisha Castle-Hughes as Mary who looks impressive even in the brief glances we see here. There are links to all my blog posts on this film here. Having reviewed Mark Dornford-May's Son of Man a fortnight ago, I now want to examine the passages from the bible it utilises. This is slightly more complicated than usual as the modernisation necessarily distorts some of the passages. It's also difficult because the imaginative treatment of Jesus's death is a more symbolic treatment of the events than a literal modernisation, but more of that below. The following paragraph contains spoilers. 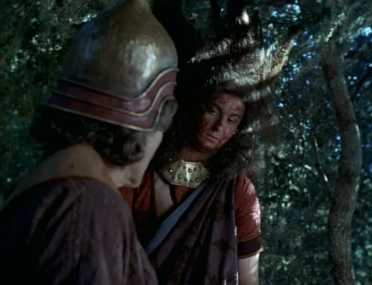 As referred to above, the most inventive re-interpretation in the film is the events of Jesus's final week. In order to create a credible scenario, and to fashion the most compelling message for it's audience, Dornford-May moulds the arrest and death of Jesus into that of modern, African, minority-resistance leaders. So the narrative departs from the biblical order of events as early as the Triumphal Entry. Immediately afterwards Jesus meets with Caiaphas and Annas ("The Elders") in the parallel of the Sanhedrin (or not) trial scenes. Pilate then meets with the elders and agrees to turn a blind eye to their actions regarding Jesus - washing his hands in the process. 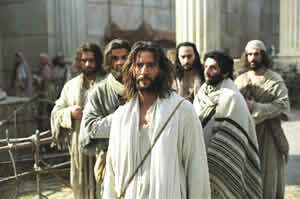 The film then moves to the Last Supper and Gethsemane and Jesus's arrest. However, when Jesus is mocked and beaten, he is beaten into a coma, and then placed in the grave, and then shot. 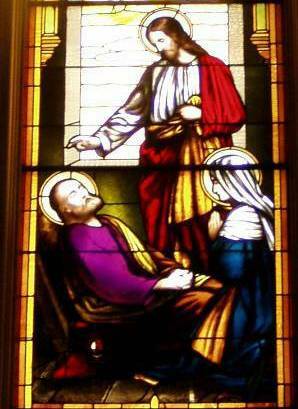 It is left unclear as to whether Jesus dies from the beating or from the shooting. However, then his mother Mary learns of the location of Jesus's body and releases him from the grave (a "resurrection" of sorts). Mary then displays his body on a cross - the significance of which is discussed in my review. Finally, we see Jesus climbing a hill with a host of the feathered angel boys - a scene of ascension. The result is a iconic yet modernised depiction of the events of Christ's death which relies on visual and thematic similarities for its points of comparison rather than strict adherence to the original narratives. The issue of laying down arms is key to this film. 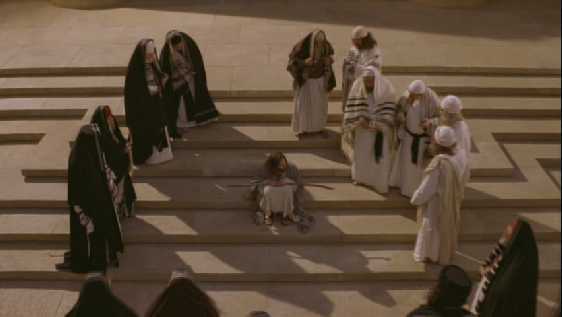 The common episode from John 8 where a mob is dissuaded from executing an adulteress is not only included here, but also preceded by a scene where Jesus gets the twelve to surrender their guns. Both scenes how weapons of one form or another being laid down. Later when the Sermon on the Mount is disbanded by government soldiers Peter considers throwing a rock, only for Jesus to order him not to, prefiguring the arrest in the garden. This ties in with the film's overall theme of non-violence and a call to a peaceful resistance movement. Matthew, for example, is not a tax collector called to surrender his ill gotten wealth, but a resistance fighter who has to lay down his arms to follow Jesus. I want to revisit the various blocks of teaching in a later post, as in most cases it has been radically revised. Essentially, each section of teaching pieces together a number of disparate phrases from the gospels, and then updates them so they form coherent sermons to the modern world he inhabits. That said one speech is delivered to a crowd from the top of an iron shack - a subtle reference to the Sermon on the Mount. The Nativity Story Blog has the news that a "photo book" to accompany the movie will be released in November, and in fact it's already available to pre-order from Amazon. It looks like it will be a similar kind of book to the one that accompanied Mel Gibson's The Passion of the Christ - a glossy "coffee table book". Hopefully though, even given Hardwicke's reputation for hard-hitting realism, this one will be a little more appropriate for the task! See all posts on this film here. 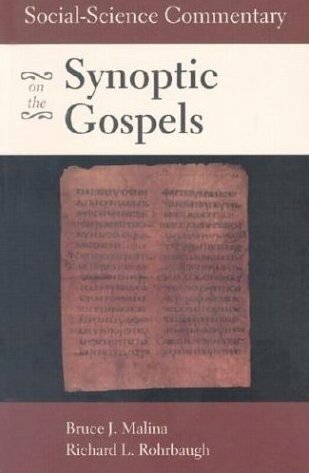 My wife and I have been working through Philip Saville's Gospel of John (2003). It's one of those films that there is obviously no point doing a scene analysis for because it's a word for word reproduction of the fourth gospel. However, there is plenty of other things to say about the film. Firstly, in watching it again, I'm surprised that this film avoided criticism for being anti-Semitic given that it was released during the period when Mel Gibson's film was being pre-emptively protested against. It's true that this film did employ the wise tactic of utilising an advisory panel of scholars, and that the film-makers implemented one of their suggestions to open the film with some text explaining the context in which the gospel was written. Nevertheless, when I try to explain the problems with Gibson's film, the kinds of problems that I tend to point to all seem to be present here. Lack of neutral Jewish characters (tick). 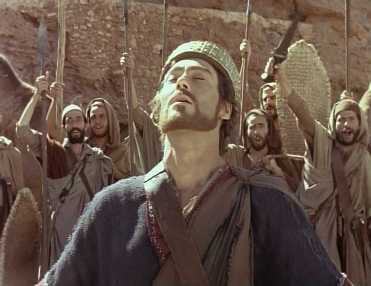 A noble sensitive Pilate in contrast to a swarthy, shifty looking bunch of Jewish elders (tick). There are various other points of similarity, but most of these relate to the text, and here the comparison falters. 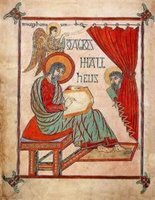 The Gospel of John is, by nature of the project, stuck with some of its textual difficulties, and these are mitigated to some degree by the disclaimer. Gibson, on the other hand, had free reign, and so chose to favour John's weak-willed Pilate, instead of the butcher we read about in Luke 13:1-3 (and various non-biblical sources). Of course, you could ask why the film-makers chose this particular gospel instead of Mark or Luke (having already completed Matthew in 1994), but then I suppose the similarities between the synoptic gospels would make John the most appealing. 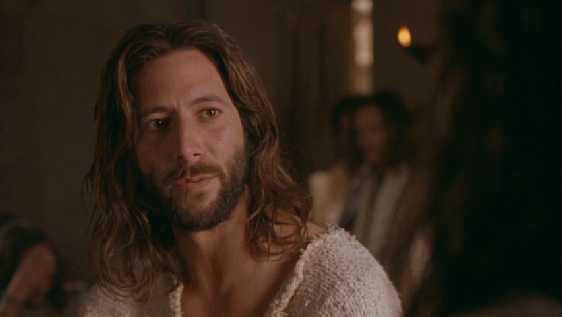 Once again I was impressed with Henry Ian Cusick's portrayal of Jesus. Cusick notes in one of the DVD extras that there are certain Johannine passages which he couldn't do anything but recite with a degree of anger. Given that there are a several such confrontational passages, it's surprising that Cusick's Jesus still manages to come across as warm and approachable. 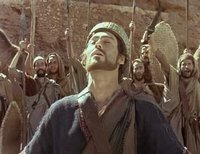 Equally impressive is Christopher Plummer's narration, and Stuart Bunce's silent role as "John",(who should really have been credited as "the disciple whom Jesus loved"). It's interesting (and perhaps a little disappointing) that it's Plummer, not Cusick who gets to deliver the immortal words of John 3:16. Given that the gospel puts them on Jesus's lips, I'd be interested to see the proportion of films using this verse that actually have Jesus saying it. I was also impressed with some of the historical details that this film gets right, and in a few cases it chooses to go against the majority of Jesus films. Most notably, Jesus is nailed to the cross through his ankles on either side of the upright. I've always intrigued by the way numerous portrayals show the crucifixion of the two theives in a variety of ways, but Jesus is usually crucified in accordance with standard iconography. 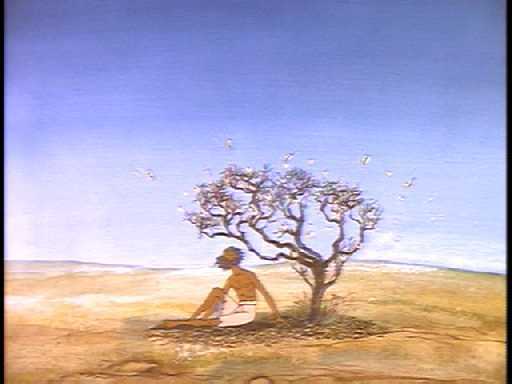 A break was made with this pattern for the Jesus films of the late eighties (Last Temptation of Christ and Jesus of Montreal), but things soon settled down again. Another such break is made with the mode of Jesus carrying the cross piece. 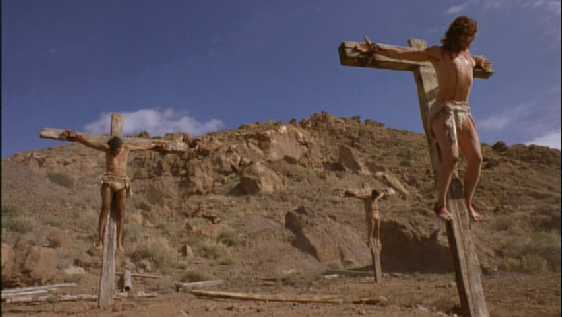 Until Jesus of Nazareth in 1977 films tended to portray the whole cross being dragged up to Golgotha. Since then, most films (although not Gibson's) have shown Jesus just carrying the crosspiece upon his shoulders. Here though, the crosspiece is simply slung over just one shoulder. I have no idea that there is anymore historical precedent for this, but I suppose at least it draws the viewer's attention to the uncertainty we have over this part of the practice. 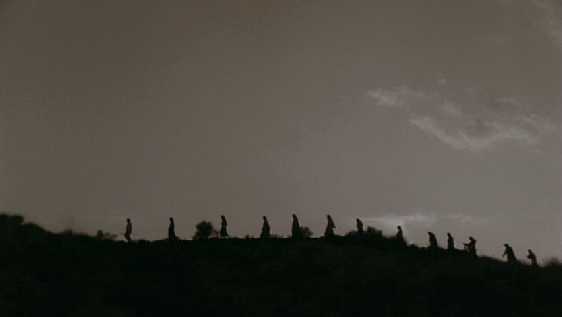 Finally, the shot on the right, really stood out this time around as reminiscent of the closing shot from Ingmar Bergman's The Seventh Seal. In fact, the only time the shot is not overlaid in John, is when it is shown in a black and white flashback. I wonder if this is an intentional reference or just coincidence. I've made a number of small-ish changes to my layout today. Firstly I've added some extra links to he header. In addition to the indexed and linked lists of Old Testament films, Jesus films and other New Testament Films, I've also added a book index (which is link-less at the moment), and my citation policy for my Jesus film scene guides. 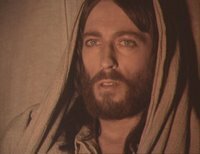 I've also put links there for my "Jesus in Film" course notes, and my 30 Film Jesus Scene Guide Spreadsheet. Elsewhere, I've changed some of the links in the sidebars. 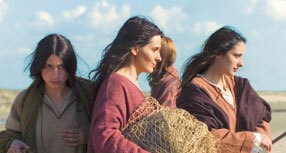 Most importantly, I've added a list of links to various sites about forthcoming bible movies. I've also added links to a few more things I've written elsewhere, and tweaked a couple of links in my blogroll. In particular, Ron Reed has now moved his Soul Food Movies, and, even better, has started posting regularly. I'm really pleased about this. Ron is a good friend, and a brilliant writer. I've not had much time to peruse his content, but I intend to spend some time there in the very near future. Any thoughts or comments would be appreciated. The header links looked a little denser than I'd like, and I've probably messed up some of the links in the middle of all this too! Tyler Williams posted an interesting piece whilst I was on holiday last week called The Strange New World of the Bible. The heart of the piece is a summary of Bruce J. Malina and Richard L. Rohrbaugh’s "Social-Science Commentary on the Synoptic Gospels", and Tyler lists a number of differences Malina and Rohrbaugh find between our industrial world and the agrarian world of the Bible. * In agrarian societies more than 90 percent of the population was rural. In industrial societies more than 90 percent is urban. * In agrarian societies 90-95 percent of the population was engaged in what sociologists call the "primary" industries (farming and extracting raw materi­als). In the United States today it is 4.9 percent. * In agrarian societies 2-4 percent of the population was literate. In industrial societies 2-4 percent are not. * The birthrate in most agrarian societies was about forty per thousand per year. In the Unites States, as in most industrial societies, it is less than half that. Yet death rates have dropped even more dramatically than birthrates. We thus have the curious phenomenon of far fewer births and rapidly rising population. * Life expectancy in the city of Rome in the first century BCE was about twenty years at birth. If the perilous years of infancy were survived, it rose to about forty, one-half our present expectations. * In contrast to the huge cities we know today, the largest city in Europe in the fourteenth century, Venice, had a population of 78,000. London had 35,000. Vienna had 3,800. Though population figures for antiquity are notoriously dif­ficult to come by, recent estimates for Jerusalem are about 35,000. For Capernaum, 1,500. For Nazareth about 200. * The Department of Labor currently lists in excess of 20,000 occupations in the United States and hundreds more are added to the list annually. By contrast, the tax rolls for Paris (pop. 59,000) in the year 1313 list only 157. * Unlike the modern world, in agrarian societies 1-3 percent of the population usually owns one- to two-thirds of the arable land. Since 90 percent or more were peasants, the vast majority owned subsistence plots at best. * The size of the federal bureaucracy in the Unites States in 1816 was 5,000 employees. In 1971 it was 2,852,000 and growing rapidly. While there was a political, administrative, and military apparatus in antiquity, nothing remotely comparable to the modern governmental bureaucracy ever existed. Instead, goods and services were mediated by patrons who operated largely outside governmental control. * More than one-half of all families in agrarian societies were broken during the childbearing and child-rearing years by the death of one or both parents. In India at the turn of the twentieth century the figure was 71 percent. Thus widows and orphans were everywhere. * In agrarian societies the family was the unit of both production and consump­tion. Since the industrial revolution, family production or enterprise has nearly disappeared and the unit of production has become the individual worker. Nowadays the family is only a unit of consumption. * The largest "factories" in Roman antiquity did not exceed fifty workers. In the records of the medieval craft guilds from London, the largest employed eight­een. The industrial corporation, a modern invention, did not exist. * In 1850, the "prime movers" in the United States (i.e., steam engines in factories, sailing vessels, work animals, etc.) had a combined capacity of 8.5 million horsepower. By 1970 this had risen to 20 billion. * The cost of moving one ton of goods one mile (measured in U.S.:dollars in China at the beginning of the industrial revolution) was: Steamboat 2.4; Wheelbarrow 20.0; Rail 2.7; Pack donkey 24.0; Junk 12.0; Packhorse 30.0; Animal-drawn cart 13.0; Carrying by pole 48.0; Pack mule 17.0. It is little wonder that overland trade at any distance was insubstantial in antiquity. * Productive capacity in industrial societies exceeds that in the most advanced agrarian societies known by more than one hundredfold. * Given the shock and consternation caused by the assassination of John F. Kennedy and the forced resignation of Richard M. Nixon, we sometimes forget that this sort of internal political upheaval is nothing like it was in the agrarian world. Of the 79 Roman emperors, 31 were murdered, 6 driven to suicide, and 4 were deposed by force. Moreover, such upheavals in antiquity were frequently accompanied by civil war and the enslavement of thousands. Of course this is just the tip of the iceberg, particularly when you consider there was a very different religious and political context which needs to be taken into consideration as well. 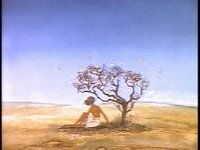 I was reminded of Tyler's post last night when reading some of Jesus's parables in Nikos Kazantzakis' "Last Temptation", and in particular the Parable of the ten Virgins from Matt 25:1-13. There are a whole host of strange cultural practices going on here. For example, what is the role of these virgins? Why is the bridegroom not arriving until a lamp is required? Why are the late virgins locked out? Having recently read Geza Vermes' "Jesus the Jew" (the latest version of which coincidentally features a picture from the film of Last Temptation) I also wonder what exactly is meant by virgin in this context. Anyway, it strikes me that these questions are also the ones that face filmmakers looking to make films based on the bible (whether they choose to confront them or not!). 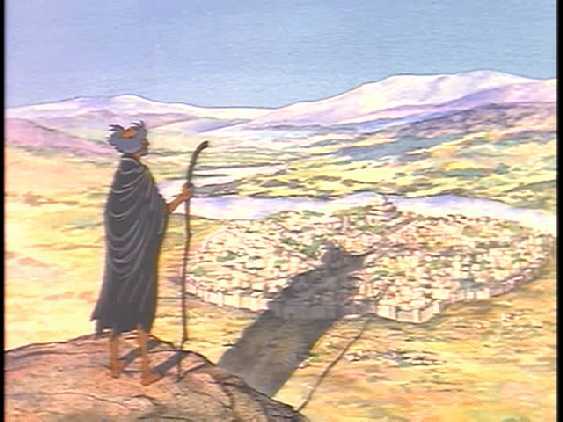 The types of bible films we face can, broadly speaking, be split into two camps: those that attempt to show the events in a setting that is apparently the first century (or whichever period the events happened in), and those that offer a more stylised presentation. In the first group of films the challenges are more straightforward, but the success with which the filmmakers answer them is more obvious to casual viewers. In the latter category, on one level it is easy for the filmmakers to "get away" with not considering these questions, but if they are to take them into account they have a far harder task. Malina and Rohrbaugh's questions also provide a filter for looking at bible films. For example, simply reading through the bullet points above reminds me of Pasolini's Il Vangelo Secondo Matteo (The Gospel According to St. Matthew - 1964). Pasolini's neo-realist use of non-professional actors taken from agrarian southern Italy feels far more authentic that George Stevens's cast of Hollywood stars (even though both were filmed almost two thousand years after the events they depict). The point about more than half of all families seeing one or more parent die during the child-bearing and child-rearing years also stuck out. I cannot recall a film which features Jesus's earthly father Joseph as present during his ministry. I assume this is largely because scripture never mentions him outside the birth and childhood stories (other than verses such as John 6:42). That said, there are a couple of Jesus films which actually show Joseph dying, the longer cut of Jesus of Nazareth (1977) and Jesus (1999). Both films use this event as the catalyst for Jesus to start his ministry. 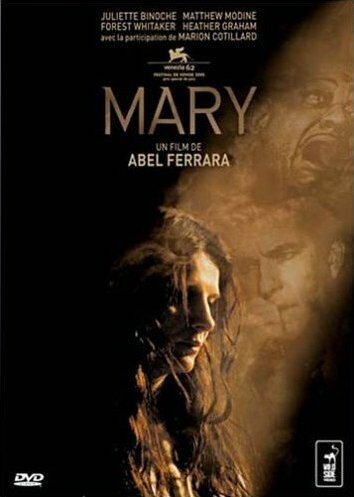 This will be old news to anyone who also follows my friend Peter Chattaway's blog, but The Reeler has announced that IFC Films will be distributing Abel Ferrara's recent film Mary. Though it's not yet been confirmed on the IFC Films' website it's encouraging news. The film has already been released in France, Italy, and a number of other European Nations, but has only been seen at a handful of film festivals in the US, and not at all in the UK. Whilst that means it will still be a while until I get to see it, it means that there is at least a chance I will get to see it in a cinema at some stage. 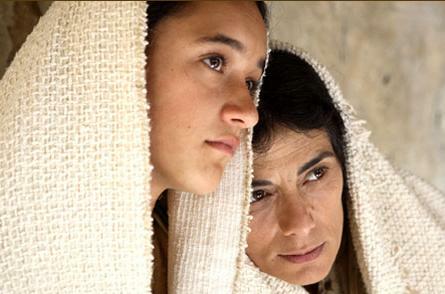 Even more encouraging is the news that Mary is being release onto DVD in Europe in October. Unfortunately the information at the Amazon.fr website doesn't reveal whether it will be dubbed or subtitled for French customers and so I can't work out whether or not someone who only speaks English will be able to watch it and, more importantly, understand it. It is apparently going to be a 2 disc, "Edition Collector". I'll be interested to see what extras are actually going to be on the discs once more details about the DVD are released. 2 discs for an 83 minute, relatively obscure, film suggests that there will be a number of extra features. Back in February I suggested that Alex Grazioli's Odyssey in Rome would be one of them given it is essentially a making of / behind the scenes affair. Elsewhere, Jeffrey Wells has suggested that Rafi Pitts' Ferrara documentary Not Guilty should also be included. The movie examines the relationship between performance and contrition. All the characters are actors; some are trying to open a channel to God while others are putting on a show intended to earn some grace. It’s a fitting topic for Ferrara, whose movies frequently embrace the same contradictions. They’re all here in Mary—the excess, the guilt and the search for truth. Intriguingly jumbled with some assembly required. Another fact from "The Guinness Book of Film Facts and Feats". 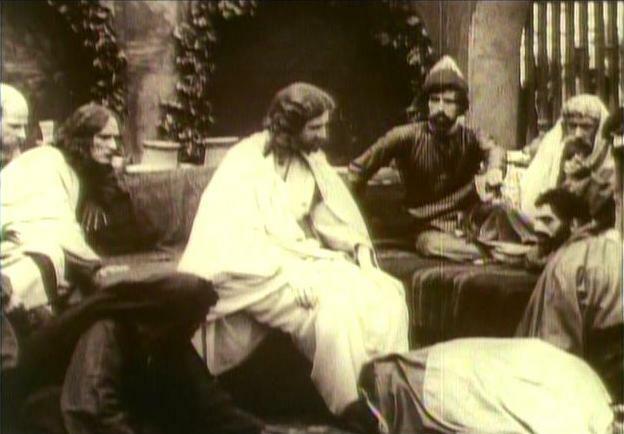 The 1912 film From the Manger to the Cross is often cited as (one of) the first feature film(s) ever made. Here (p.17) it lists the earliest feature films made in the US, and From the Manger ranks fourth, with Oliver Twist being released in 7 months earlier in June 1912. But it appears that both of those films were well beaten to the tile of first ever feature length film by a 1906 Australian Film about Ned Kelly, The Story of the Kelly Gang. Also ahead of the From the Manger is the 1909 French film L'Enfant Prodigue (which sounds like another bible based film and was the first European feature length film). Interestingly, there's no mention at all of The Life and Passion of Jesus Christ, which some have also claimed was the first feature length film. 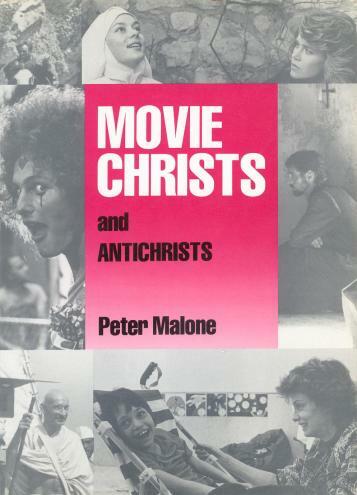 I've just bought a copy of Peter Malone's "Movie Christs and Antichrists", which was one of the first books to look seriously at films about the Bible. It's relatively lightweight to later books such as Babbington and Evan's "Biblical Epics", but it looks to be an interesting book. I was surprised to find there's some info on Spoof Moses movie Wholly Moses, as the only other place I've found discussion on that film in print is in a Dudley Moore biography. 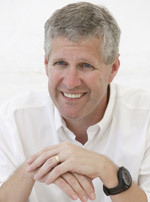 Malone now heads up Signis, the World Catholic Association for Communication, and was also an interviewee on Channel 4's The Passion Faith, Films and Fury. I recently got hold of a copy of "The Guinness Book of Film Facts and Feats". Whilst it's only the 1979 edition, and as a result many of the records will now have been broken, many of the entries are "the first film to do X", and so, baring new evidence, they still hold. A number of the entries I've come across already relate to bible films, and the following one grabbed my attention in particular. The 1898 Passion Play was apparently the first film to separate the functions of producer and director (p.133). The entry goes on to note how said director, Rich G. Hollaman, had never actually seen a movie, and so tried to make a series of still shots instead, rushing onto the set to shout "Hold it" whenever the cameras were rolling. Eventually, the film was shot in his absence in the early evening thanks to the cameraman convincing him the light had gone to get rid of him. Eventually they made it to two reels in time for it's opening at Eden Musee in January 1898. It seems stange that the first film to have a director was also possibly the first to have no director at all. 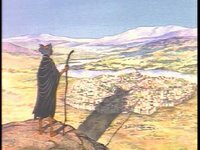 There's various bits and pieces going on with some of the bible films that are currently in production (to use that term loosely), none of which justify a whole post, but are worth picking up on. Not much new for The Nativity Story, but there has been this article from Preview Family Movie Review where a couple of high profile Christians are already endorsing this film for biblical accuracy, and artistic merit before it's even been finished. Perhaps they have seen extensive shots from the film and read some version of the script, but I don't see how these people can say these things with any integrity when the movie is such a long way from completion. Surely they know disclaimers such as "from what I have seen" mean very little when they preface such extravagant praise (and when they can of course be cut out a a later date)? 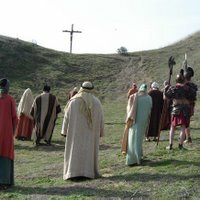 Color of the Cross has had its website updated (and lost the quote from Bible Films Blog! ), and is giving a release date of 27th October. So the Q&A that I discussed a while back is gone, but there are cast and crew biographies, and several more stills from the film. There also appears to be something by actor/director Jean Claude La Marre, but I can't get it to play. Things are moving apace with The Gospel According to John. The board has made a donor declaration (if they don't get enough they'll contact you and ask you where you want to give it to instead). There's also two MP3 interviews with Bruce Marchiano about the project. The official website is now saying it's going to reach cinemas on the 13th October 2006. That's later than the last date that was given of September '06, and is 2 years after the date they had originally planned for (October 2004), but it is specific enough to make me hope that it might really happen this time. The Ten is shaping up for a 2007 release. There's not much on the City Lights website, but the IMDB now has an extensive cast list. David Wain will direct. It's been said many times that Jesus didn't just arrive on earth simply as a man, but he came to first century Judea, as a first century Jewish man. Over the centuries, that incarnation has given artists of every age and race sufficient scope to bring Jesus to the people dressed in their own skin and culture. 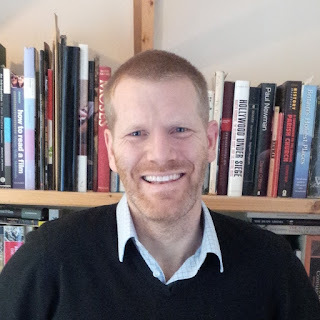 Mark Dornford-May's Jezile (Son of Man), which sets the Jesus story in the context of a modern, anonymous African township, is the most recent addition to this rich history, and the first time such a re-contextualisation has been attempted in a film made outside North America. There are three major challenges to such a project. Firstly, the actor playing Jesus has to be engaging and believable in the role, and this gets harder as the actors looks move further away from the disappointgly popular, floaty white robes, long hair and a beard stereotype. 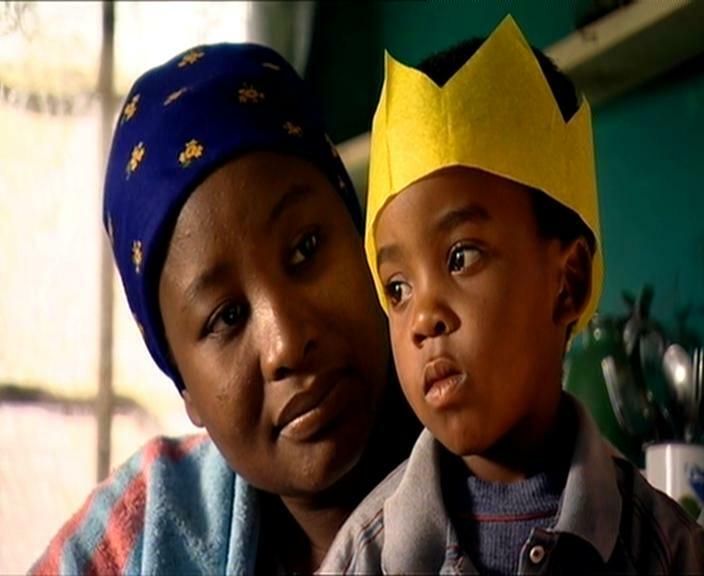 Andile Kosi, who plays Jesus, is almost the polar opposite of that stereotype - a short haired, shaven, black-African dressed in jeans and a checked shirt. Yet it is easy to relate to him in the role, not simply because he is the one doing the talking, but because he effortlessly blends strength and compassion, and an easy going nature with a compelling, passionate personality. Secondly, the film has to draw creative and, more importantly, credible representatives of the key figures and events of the original story. If these don't ring true, or they feel too simulated, the whole project comes off as contrived. The creativity and initiative shown here is truly impressive managing to both embody the biblical narratives whilst also tearing through pious and kitsch tradition. The healing of a paralytic lowered through a roof feels far more natural than it ever did in any telling of this story set in the first century. Likewise, Herod's slaughter of the infants is brought uncomfortably close to home, creating fear and tension even though we know Jesus's survival is assured. Jezile also breathes new life into over-familiar bible characters. The shepherds are mere boys, as are the angels who appear to them. The disciples are drawn from both peaceful men (and women) and from freedom fighters who are challenged to lay down the weapons as well as their lives. Following on from this is the third difficult area, namely that Jesus has to have something tangible to oppose that resonates with the film's audience. Godspell for example, fizzles out just when the story should be starting to get interesting, simply because there is no such obvious opponent. When it comes to his big confrontation all they can find oppose him is a poorly made robot. Here however, the enemy is far more real. The backdrop of politics and corruption that leaves millions living in tin shacks around many African cities is something one cannot help but imagine that Jesus would oppose if he were around today, and it is hard not to imagine that those who benefit from this state of affairs would want to destroy anyone who threatened such a profitable status quo. 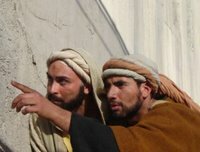 Pilate's troops masquerade as agents of peace from a neighbouring country, maintaining their power by manipulating local gangland leaders Caiaphas and Annas. Finally, the film has to work well as a film, and it is this area in particular that has seen the film gain such strong praise from those who saw it at Sundance. Whilst Dornford-May primarily has a background in theatre, he has quickly adjusted to his new medium. He uses a variety of techniques to bring the film that bit closer to modern viewers, including shooting some of the film's narration in the style of news footage, and showing other scenes, in particular the supernatural elements, as shot through a camcorder. That said, he blends them well with more naturalistic, and intimate footage to prevent them becoming gimmicky, or the film becoming too much of a documentary. Dornford-May also allows the camera to dwell on the incredible scenery that surrounds the townships, comparing the beauty of God's creation with the unsightly shacks that humanity has left some of its members to live in. One of the other things Dornford-May attempts is re-inventing key works of Christian painting. So early on we see Jesus as a child sat on Mary's knee, wearing a party hat crown. 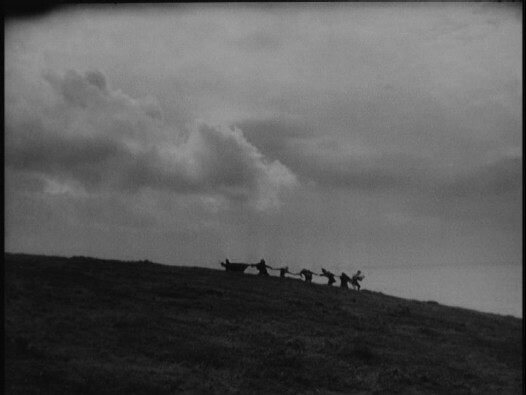 The film dwells on this motionless scene for several seconds. 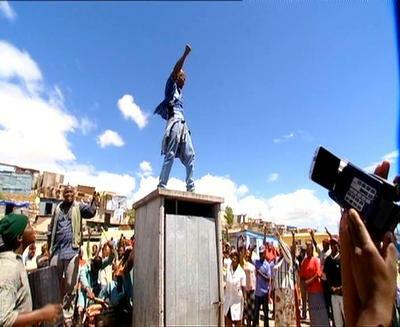 Likewise after Jesus's death, Mary (played by the director's wife and co-writer Pauline Malefane) holds his body in the traditional "Pieta" pose, only here they are on the back of a truck driving along the road. 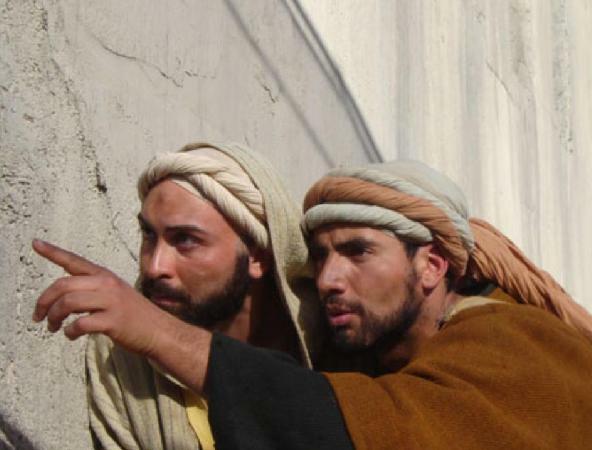 The film also comments on the way Jesus's activity was recorded and preserved for a wider audience. As noted above Jesus's miracles are recorded on camcorder by Judas, and used as evidence against him. Conversely, Jesus's actions start to be recorded and celebrated in murals on walls in the townships, disseminating the stories about him into accessible "language", and announcing them to a wider audience. As a result Jesus's popularity grows, and he begins to pose more of a threat to those in power. At this point, everyone in the audience knows Jesus's days are numbered, and it's no real surprise when Jesus is arrested shortly after sharing a final meal with his followers. What is surprising however is his crucifixion and death. (Readers wanting to avoid spoilers are advised to move onto the next paragraph). Jesus, like so many anti-apartheid leaders before him, is beaten to death, and buried in a shallow grave. In South Africa, the families of those murdered in a similar way eventually decided to break a strongly held African taboo and display their dead bodies for all to see. In so doing, they were able to show that their loved ones had not simply had an unfortunate accident, as the authorities often claimed, but had clearly been murdered. So the film reflects this later tradition. Once Jesus's body is found, it is his friends and family that tie Jesus's dead body to the cross. Christian theology has often held that the cross declares to the (spiritual) powers that be that their days are numbered. This crucifixion makes a similar declaration to the political powers. It's a political end to a very politically charged version of the Christ story. Whilst the film has no real doubts about Jesus's divinity - showing a number of miracles, prayers and confrontations with Satan, it is the political aspect of Jesus's brief time on earth that is of most concern. Many European and American Christians, living in a culture where religion and theology have been almost totally separated, will not be entirely comfortable with this. 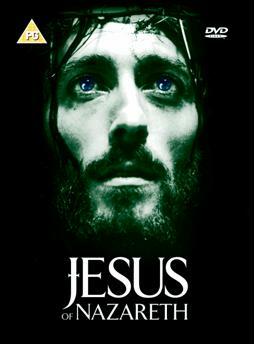 Yet Jesus's core belief in this film is that "This is my world" - a statement that is both political and theological . Likewise, when the early Christians claimed Jesus was King and Lord of all the world, they also meant that therefore Caesar wasn't. Such radical, political statements lie at the hearts of Son of Man, and we ignore them, and it, at our peril.